AccuWeather Global Headquarters – January 11, 2017 – AccuWeather reports a multi-faceted storm will jam a thaw, heavy rain and flooding, as well as ice, snow and a freeze-up into the northeastern United States to end this week. 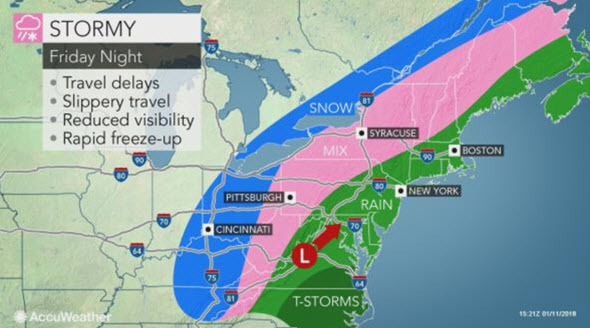 The storm may bring major travel disruptions throughout the region. Some areas will be at risk for flooding, while others may face power outages and property damage related to freezing rain, followed by snow and a freeze-up. Rounds of heavy rain and fog will be the triggers for airline and ground transportation delays from Virginia to coastal Maine. One round will develop near and west of the Appalachians during Thursday night and spread eastward on Friday. The second round of rain and risk of major travel disruption is forecast to spread northeastward with the main storm from Friday night to Saturday morning. Back toward the Appalachians, there may be a less-defined separation between the two main batches of rain. Some motorists may encounter flooded roadways. The risk of urban flooding will not be limited to areas with existing heavy snow cover. The thaw may be rapid enough, combined with drenching rain to lead to ice jams on some of the rivers. Low river levels at the onset of the thaw and storm may allow ice jam flooding to be contained to low-lying, unprotected areas along the streams. Flat roofs will be at greatest risk of collapse. Following a surge of warmth with rain, progressively colder air will invade the region, while the storm is still in progress. The cold air will catch up with the rain and cause a change to ice and snow from the Appalachians to the eastern Great Lakes and the St. Lawrence Valley. 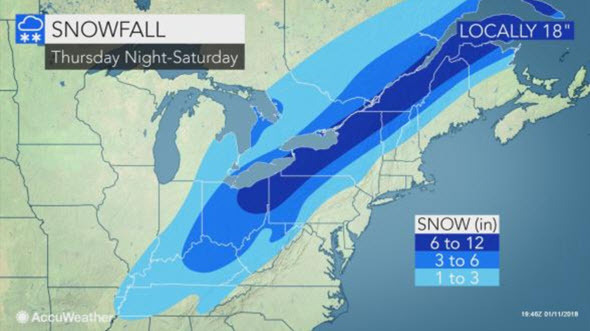 Motorists on the highways from West Virginia and western Maryland to western and northern Pennsylvania, much of upstate New York and western and northern New England will be at risk for getting caught up in an ice and snowstorm during Friday night and Saturday. This includes portions of I-70, I-76, I-77, I-79, I-80, I-81, I-86, I-87, I-88, I-89, I-90, I-91 and I-93. The colder air followed by ice then snow will creep in from the north and west. Temperatures will plunge into the 20s F, after being in the 30s, 40s and 50s earlier in the storm. A period of dangerous sleet and freezing rain can occur anywhere from the Appalachians on north and west in the region. There is the potential for ice to accrue on trees and power lines to a thickness of 0.25 of an inch or greater in this area. Since a fast progression to cold air is now expected, the period of freezing rain may be held to a few hours, which may restrict how much ice adheres to elevated surfaces. Even 0.25 of an inch of ice may weigh down trees and power lines to the point of causing sporadic power outages. However, where several inches of snow falls and clings to these surfaces after a period of freezing rain, a disaster may unfold in some communities. More than a foot (30 cm) of snow may fall on a narrow swath from part of central and northeastern Ohio to northern Maine and New Brunswick. Cities that may blanketed by heavy snow include Cleveland, Buffalo, Montreal and Caribou, Maine. Recent warmth may cause some of the snow to partially melt near the ground and cling to trees and power lines. People should expect travel conditions to range from poor to extremely difficult and dangerous from Saturday to Saturday night in the storm’s wake. Even where more snow or sleet occurs and spares some areas from a heavy accumulation of freezing rain, the temperature plunge in the wake of the storm will make it difficult to remove all of the wintry accumulation from area roads and sidewalks. AccuWeather meteorologists recommend that crews and property owners remove the wintry precipitation promptly before temperatures plummet. Airports, including the major hubs at Pittsburgh, Detroit and Cincinnati, may be in cleanup mode, while airlines may be in recovery mode this weekend. Even areas in the I-95 corridor can expect areas of moisture and standing water to freeze later Saturday and Saturday night. Motorists and pedestrians from Washington, D.C., to Philadelphia, New York City and Boston should be on the lookout for patches of ice. Fans heading to the NFL game in Philadelphia should not be deceived by the warm, near-50-degree start to the day. Temperatures are projected to fall through the 20s as the late-afternoon game progresses. Frigid air will also make the trip to Foxboro, Massachusetts by Saturday evening. By Sunday, high temperatures are forecast to be no better than the teens in the Appalachians and the lower 30s along much of I-95. Low temperatures Sunday night are projected to range from subzero north and west to near 20 along the mid-Atlantic coast. AccuWeather meteorologists are monitoring the potential for another winter storm during the middle part of next week. That storm may unload heavy snow across the interior mid-Atlantic and New England and perhaps a combination of rain and snow along the coast.